Enter the Cael Hammer Giveaway! How would YOU like to own your very own life-sized, scale version of the Kid's lifelong friend, the Cael Hammer?! Well, we've commissioned a beautiful replica from the masters at Volpin Props, and we're GIVING IT AWAY! To enter, all you have to do is subscribe to the Supergiant Blast, our monthly email newsletter where we give you the inside scoop about what we're up to. Already a subscriber? Then, you're all set! We'll select the lucky winner after October 20, 2018. WATCH: This video reveals the meticulous craft and attention-to-detail that went into this stunning piece! The real-life hammer features fine details above and beyond the original! Q: Wait, you're giving away the Cael Hammer?! How do I sign up? A: We are, indeed! To have a chance to win, just make sure you've subscribed to our Supergiant Blast newsletter by October 20, 2018. We'll announce the lucky winner in a subsequent installment! Q: So I can just subscribe to the Blast for the contest, then unsubscribe after? A: Sure! The Supergiant Blast is meant for you. If you don't like it, unsubscribe; we'd appreciate any other feedback! Q: Hypothetically speaking, were I to win, could I... smash stuff with it? A: Please, no! This is a life-size replica designed for display, not for destruction. We want to make absolutely sure it finds a warm and loving home. Q: Are there any restrictions on who can enter? A: There's always a catch, right...? This giveaway is open to U.S. residents only. As each country tends to have its own unique laws and regulations around these types of giveaways, this restriction was the only way we could make this giveaway happen. Our alternative was not to do it at all, and we decided to do it. We appreciate your understanding in this. Q: Do you happen to have a big, long block of legalese containing the rest of the rules of the giveaway spelled out in meticulous detail? A: Why, yes, we do, here you go! 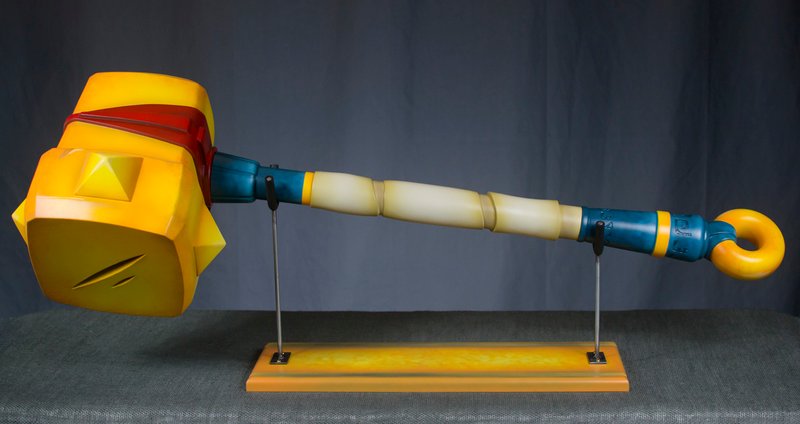 SUPERGIANT GAMES, LLC (“SUPERGIANT GAMES”) IS GIVING AWAY AS PART OF A GIVEAWAY PROMOTION (THE “GIVEAWAY”) ONE CUSTOM-MADE REPLICA OF THE "CAEL HAMMER" - A WEAPON FROM OUR GAME, BASTION (THE “CAEL HAMMER” IS THE “PRIZE”, AND MAY ALSO BE REFERRED TO AS THE “HAMMER”). THESE RULES (“RULES”) SET FORTH THE RULES GOVERNING THE GIVEAWAY AND CONTAIN IMPORTANT TERMS GOVERNING YOUR PARTICIPATION AND OBLIGATIONS SHOULD YOU BE A WINNER. PLEASE READ THESE RULES CAREFULLY AND YOU ARE WARNED THAT YOUR ACCEPTANCE OF A PRIZE UNDER THIS GIVEAWAY WILL REQUIRE THAT YOU GRANT SUPERGIANT GAMES CERTAIN RIGHTS AND LICENSES IN ORDER FOR YOU TO OBTAIN SUCH PRIZE. Eligibility: This Giveaway is open to anyone who is a subscriber to our Supergiant Games monthly newsletter (“the Supergiant Blast”) who are subscribers anytime during the time period from between September 28th, 2018 and October 19th, 2018 who are also legal residents of the United States of America (all such subscribers are “Eligible Participants”) and is void where prohibited by law. Employees of Supergiant Games, LLC., its affiliates, subsidiaries, advertising and promotion agencies, and suppliers, (collectively the “Employees”), and immediate family members and/or those living in the same household of Employees, are not eligible to participate in the Giveaway. The Giveaway is subject to all applicable federal, state, and local laws and regulations and the Giveaway is void where prohibited. Acknowledgement of Rules and Withdrawal: These rules (“Rules”) govern the operation of the Giveaway and YOU ARE HEREBY PUT ON NOTICE THAT PRIZES ARE AWARDED SUBJECT TO THESE RULES. If you do not wish to be considered in the drawing, please contact Supergiant via email at info@supergiantgames.com and Supergiant will not enter you in the drawing. How to Enter: All Eligible Participants are automatically entered in the Giveaway, but if you are not an Eligible Participant, you may enter the Giveaway by mailing a postcard to Supergiant Games, LLC at 521 Gough Street, San Francisco, CA 94102 with your name, an active email address where Supergiant Games can contact you, a statement that such postcard is an entry for the Cael Hammer giveaway promotion. All who enter via postcard are also an “Eligible Participant.” All postcard entries must be received by October 19th, 2018 at 11:59pm PST to be eligible for a chance to receive the Prize. Prize: All Eligible Participants will be entered into a drawing where one Hammer will be awarded to an Eligible Participant. The one Eligible Participant who is awarded the Prize is deemed the “Winner.” No cash or other prize substitution is permitted except at Supergiant Games’ discretion. The Prize is nontransferable. No substitution of prize or transfer/assignment of prize to others or request for the cash equivalent by any Winner is permitted. 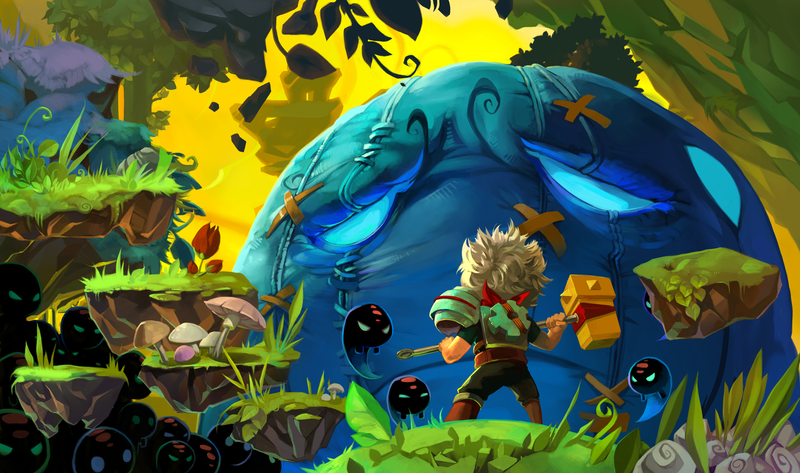 Acceptance of a prize constitutes permission for Supergiant Games to use Winner’s name, entry, portrait, picture, voice, likeness, image, statements about the Giveaway, and biographical information for news, publicity, information, trade, advertising, public relations, and promotional purposes, without any further compensation, notice, review, or consent to or by Winner for Supergiant’s marketing and public relations purposes. In order for an Eligible Participant to receive a Prize, such Eligible Participant must sign Supergiant’s waiver and release form for the benefit of Supergiant Games that also addresses terms and obligations consistent with these Rules so that Supergiant Games has a written and signed agreement with a Winner. Odds: The odds of winning depend on the number of Eligible Participants at the time of drawing. Winner Selection and Notification: Winners will be selected by a random selection from all eligible entries under the supervision of Supergiant Games sometime after October 20th, 2018. Winner will be notified by five (5) days following selection of Winner via the email address that Supergiant has on file for such Winner. Supergiant Games shall have no liability for Winner’s failure to receive notices due to spam, junk e-mail or other security settings or for Winner’s provision of incorrect or otherwise non-functioning contact information. If Winner cannot be contacted, is ineligible, fails to claim the applicable prize within five (5) days from the time award notification was sent, or fails to timely return a completed and executed declaration and release as required, the Prize may be forfeited and an alternate Winner selected. Receipt by Winner of the prize offered in this Giveaway is conditioned upon compliance with any and all federal, state, and local laws and regulations. ANY VIOLATION OF THESE OFFICIAL RULES BY WINNER (AT SUPERGIANT GAMES’ SOLE DISCRETION) WILL RESULT IN WINNER’S DISQUALIFICATION AS WINNER OF THE GIVEAWAY, AND ALL PRIVILEGES AS WINNER WILL BE IMMEDIATELY TERMINATED. Terms & Conditions: Supergiant Games reserves the right, in its sole discretion, to cancel, terminate, modify or suspend the Giveaway should virus, bug, non-authorized human intervention, fraud, or other cause beyond Supergiant Games’ control corrupt or affect the administration, security, fairness, or proper conduct of the Giveaway. In such case, Supergiant Games may select the Winner from all eligible entries received prior to and/or after (if appropriate) the action taken by Supergiant Games. Supergiant Games reserves the right, in its sole discretion, to disqualify any individual who tampers or attempts to tamper with the entry process or the operation of the Giveaway or website or violates these Rules. Supergiant Games has the right, in its sole discretion, to maintain the integrity of the Giveaway. Limitation of Liability: By participating in the Giveaway, You agree to release and hold harmless Supergiant Games and its subsidiaries, affiliates, advertising and promotion agencies, partners, representatives, agents, successors, assigns, employees, officers, and directors from any liability, illness, injury, death, loss, litigation, claim, or damage that may occur, directly or indirectly, whether caused by negligence or not, from your participation in the Giveaway and/or your acceptance, possession, use, or misuse of any Prize or any portion thereof; (ii) technical failures of any kind, including but not limited to the malfunction of any computer, cable, network, hardware, or software, or other mechanical equipment; (iii) the unavailability or inaccessibility of any transmissions, telephone, or Internet service; (iv) unauthorized human intervention in any part of the entry process or the Giveaway; (v) electronic or human error in the administration of the Giveaway or the processing of entries. Disputes: THIS GIVEAWAY IS GOVERNED BY THE LAWS OF THE UNITED STATES OF AMERICA AND CALIFORNIA, WITHOUT RESPECT TO ITS CONFLICT OF LAW DOCTRINES. As a condition of participating in this Giveaway, you agree that any and all disputes that cannot be resolved between you and Supergiant Games, and causes of action arising out of or connected with this Giveaway, shall be resolved individually, without resort to any form of class action, exclusively before a court located in California having jurisdiction. Further, in any such dispute, under no circumstances shall participant be permitted to obtain awards for, and hereby waives all rights to, punitive, incidental, or consequential damages, including reasonable attorney’s fees, other than participant’s actual out-of-pocket expenses (i.e. costs associated with entering this Giveaway). Participant further waives all rights to have damages multiplied or increased. Winners List: To obtain a copy of both Winners’ name or a copy of these Official Rules, mail Your request along with a stamped, self-addressed envelope to: Supergiant Games, LLC at 521 Gough Street, San Francisco, CA 94102 and you will receive such copy sometime after December 31, 2018.